The Robert Redford-founded Sundance festival returned to The O2 in London recently for its second edition, and impressed again after last year's Sundance London debut. Alison and Saam managed to pop down to the 2013 fest to check out some of the finest (and not so finest) films on offer. Perhaps the most notable film highlight was 'Metro Manila' (★★★★½), an intense drama set in Manila but unexpectedly helmed by Brit director Sean Ellis. Ellis does a superb job as an impoverished family faces up to the harsh reality of inner-city life. There's something of a Greek tragedy to 'Metro Manila', and the sense of foreboding is developed and delivered magnificently - no surprise it won the Sundance 2013 Audience Award in Utah. A similar (yet incredibly different) delight was quirky teen coming-of-age comedy, 'The Kings Of Summer' (★★★★). One of the best aspects of Sundance London is that almost every screening comes with a Q+A with one of the filmmakers involved - here director Jordan Vogt-Roberts explained: "This film hopefully captures what it's like at that age. Being fourteen was the best, but simultaneously it's the most painful and awkward time you will ever experience. While unfortunately we didn't manage to catch any of the live musical events on offer - massive slap on the wrist there considering the nature of this website - we did catch a wonderful musical documentary called 'Muscle Shoals' (★★★★). The doc highlighted the people behind the influential Muscle Shoals sound that artists of the calibre of Aretha Franklin and The Rolling Stones all sought. It wasn't all roses at Sundance London however, with Michael Winterbottom and Steve Coogan's latest collaboration not living up to their reputations and Lynn Shelton's disappointing follow-up to 'Your Sister's Sister'. 'The Look Of Love' (★★) saw Coogan as "King of Soho" Paul Raymond, offering "arbitrary displays of naked flesh" and little more. Shelton's tentative 'Touchy Feely' (★★½) did provide one of the highlights of the fest, Tomo Nakayama's rendition of 'Horses'. Elsewhere, 'In A World' (★★★½) took us into the world of the voiceover, with its slightly unsure balance between comedy and drama - nonetheless, an interesting vehicle for writer/director/actress Lake Bell. 'Emanuel And The Truth About Fishes' (★★★½) offered a more deft transition - from gripping drama into a dramatic psychological thriller, and could be something of a defining role for 'Skins' actress Kaya Scodelario. We really enjoyed Sundance London, with its army of helpful (and easily identifiable!) staff/volunteers - creating an appropriately welcoming atmosphere. The O2 also acted as the perfect venue, with its ability to cater for several simultaneous sold-out film screenings and musical events, without ever seeming overly crowded. The selection for the festival was incredibly broad, highlighting the best new film talent not just from the USA. Sundance London was one of the best - and most well-run - festivals we've had the pleasure of going to. 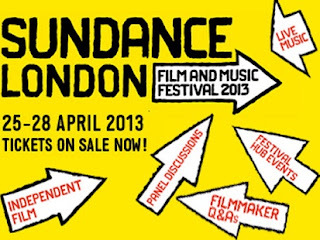 Find more info on Sundance London at sundance-london.com.